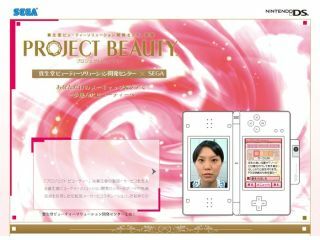 Sega's bizarre 'Project Beauty' - we're not sure if this will be made freely available on PlaySega! If you are bored at work and have unsupervised, open internet access, then the mighty Sega has just made your life better, by launching its new PlaySega website, with classic games available to play immediately, for free. Sega's new game portal site lines up some tasty Flash-based games, featuring "arcade, word, card, puzzle, quiz, Sonic and sports titles," and includes the DS title, Brain Assist, and the mobile version of Mario and Sonic at the Olympic Games. There is also a VIP section of the site which you have to pay a "small charge" to access which promises games from the Megadrive era such as Columns, Puyo Pop, and Sonic The Hedgehog. Nick Pili, Network Business Director for Sega Europe told CVG: "What started off as a small project within the Sega Network Group has now caught the imagination of the entire company." "There was a story out there recently that we have a locked vault full of retro Sega classics in Japan. Well, it's true - and we've been given full access to a lot of the properties in it." CVG adds that the games support high-score leaderboards, "and playing the games earns you PlaySega Rings - the site's currency which can be used to customise the site to your liking and create your own Escape Area" (which looks a bit like a PS3 'Home' style virtual apartment). You can also make your own Mii-style avatars as well. Seems that PlaySega ticks all the modern videogame must-have boxes! Head over to PlaySega site and you need never be bored at work ever again.